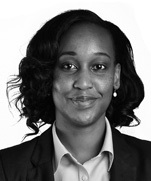 Sigee Koech is a partner at Dentons Hamilton Harrison & Mathews. She is part of the Corporate, Commercial & Real Estate team and a member of the Real Estate, Insolvency and Restructuring, Banking and Finance, and Business Set-up and Regulatory Compliance practice groups. She is also experienced in competition law and general commercial law. She has been involved in various local and cross-border corporate transactions and conveyancing dealings and has assisted on advising clients on assortment of legal and regulatory issues related to projects in the banking, and real estate sectors. She is highly regarded in the market by clients for her banking and finance practice having handled complex transactions on behalf of clients. Nine Kenyan banks: Advising in the restructuring plan as proposed by the national airline in Kenya to all of its creditors. Our role included representing the interests of our clients in complex negotiations with the airline, the Government of Kenya and other creditors, in order to improve the banks cover under the government guarantee. A proprietor of a large commercial mall in Kenya: Advising the client which obtained mezzanine financing from the largest mezzanine fund manager in Africa to pay down existing senior debt funding provided to it by a local commercial bank. A solar energy company: Acting for the client which providing off grid solutions in the financing by a regional investment bank operating in Europe. The transaction brings into perspective the practical applicability of the principle of partnership with private sector set out in the Cotonou Agreement particularly the applicability of the tax exemptions under the Cotonou Agreement and enforceability of the English Facility Agreement in Kenya. Legal 500, 2018: "Adil Khawaja is commended for his ‘knowledge and experience’ and Sigee Koech is also highly reputed." Thompson Reuters Foundation: Offered and continue to offer pro bono services. University of Pittsburgh School of Law, 2011, LL.M.